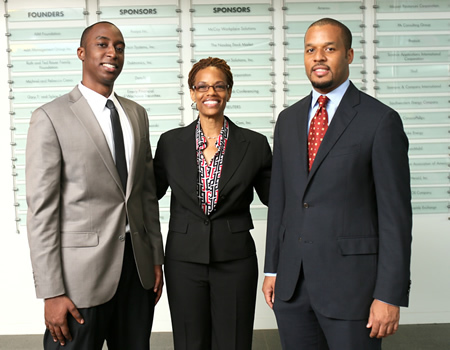 MBA students Emeka N. Akpunonu, left, and Clyde McNeil (pictured with faculty advisor Carla Jones) won The Executive Leadership Council’s (ELC) 2012 Business Case Competition. Two MBA students from the C. T. Bauer College of Business at the University of Houston won first place last week in The Executive Leadership Council’s (ELC) 2012 Business Case Competition. Emeka N. Akpunonu and Clyde McNeil were named the top team in the final round of competition on April 20. 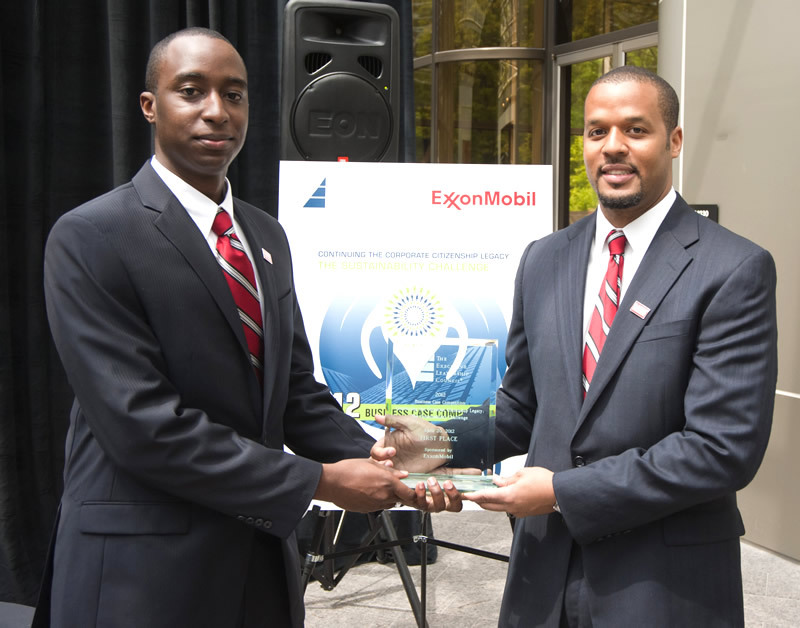 Sponsored by ExxonMobil, the competition in the finals included teams from Emory University’s Goizueta Business School and Carnegie Mellon’s Tepper School of Business. Judges represented leading corporations and non-profits, such as the Compass Group, 100 Black Men of America, AETNA, Inc., Aztec Worldwide Group, United Way Worldwide, the Silver Parker Group and the League of United Latin American Citizens. ELC’s Business Case Competition challenged this year’s teams to develop strategies for strengthening ties between the corporate social responsibility community and African-American nonprofits during tough economic times. Specifically, the competition examined how corporations can expand their global philanthropy efforts to African-American non-profits and other community groups at sustained or higher levels. “The team from Bauer College made a strong case, presenting exceptional recommendations on the steps corporations and African-American non-profits need to take to strengthen their ties,” said Arnold Donald, ELC’s president and CEO. In recognition of their first place win, team captain Akpunonu and McNeil will share a $35,000 scholarship cash award and will be recognized during ELC’s 2012 Annual Recognition Gala in October before an audience of more than 2,000 corporate, education and government leaders. Several Bauer College faculty provided insight, including Steve Koch, an executive professor of marketing; Michael Newman, a clinical professor of accounting; and Dale Rude, a clinical professor of management. Akpunonu and McNeil will share a $35,000 scholarship award for their proposal for strengthening corporate support for African-American non-profits. The team also had interview and feedback sessions with members of the local business community, including Eric Edmonds (MBA ’11), business development at Water Standard; Dipesh Desai (MBA ’11), president of ExcelNow! ; Michelle Thompson (MBA ’11); Marcus Davis, owner of The Breakfast Klub restaurant; Bruce Levine, CAZ International Human Capital Consulting; Ashley Estes, corporate fundraising at Houston Food Bank; Leslie Farnsworth, Frogdog Nonprofit Consultants; Yolanda Smith, NAACP Houston Branch; Elmer Rogers, Houston Area Urban League; Alice Aanstoos, AT&T Regional Vice President; Dan Wampler, Genesysworks Executive Director and Mark Putnam, UH Office of Development. Akpunonu and McNeil worked together to develop a team chemistry focused on submitting solid deliverables, viewing the competition as more than a “what if” scenario. Competing alongside some of the brightest MBA students from around the nation was exhilarating, he said, and perhaps even more so, was to claim the prize for UH Bauer. “Having the opportunity to positively impact the perception of UH and especially Bauer in the marketplace is extremely rewarding,” McNeil said. Congratulations! You represent our school well! Congrats to you both. The University of Houston is the first team in the state of Texas to not only place, but also win this competition!!! Go COOGS! I got tears I was so happy when I read this. I have and will always have faith that you will do great things in this life! I am so tremendously proud and happy for you! Congrats to Clyde, too! Congrats bro…..will see more of U̶̲̥̅̊…IUO Rep.
CONGRATS Clyde!!!! “With all due respect” So proud! Congratulations to the winning team and faculty advisor, Dr. Carla Jones! Awesome, Congratulations and may God continue to bless you both and your faculty advisor(s). We need more future leaders like yourselves. More dynamic COOGs.